Appalachian Ski Mtn. co-owner Brad Moretz, left, speaks about Jim Cottrell, right, during a ceremony for Cottrell on Tuesday, March 19, at Appalachian Ski Mtn. PSIA-AASI Eastern Division Region 7 Director Walter Jaeger speaks about Jim Cottrell, second from right, during a special ceremony for Cottrell on Tuesday, March 19, at Appalachian Ski Mtn. Pictured, from left to right: Reba Moretz, Charlie Sellers, Brad Moretz, Jaeger, Cottrell and Pace Cottrell. Jim Cottrell, center with his green boots, poses with a couple dozen of of the ski instructors who have come through the French-Swiss Ski College in its 50-plus years during a ceremony for Cottrell on Tuesday, March 19, at Appalachian Ski Mtn. A cake honoring Jim Cottrell and ‘The French Swiss Ski Review,’ was made for the surprise party on Tuesday, March 19. BLOWING ROCK – With dozens of family, friends, fellow instructors and special guests on hand, Appalachian Ski Mtn. 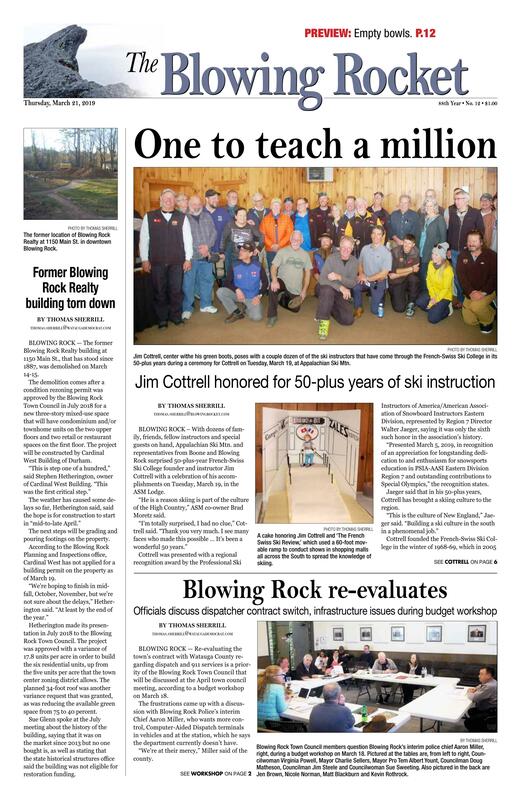 and representatives from Boone and Blowing Rock surprised 50-plus-year French-Swiss Ski College founder and instructor Jim Cottrell with a celebration of his accomplishments on Tuesday, March 19, in the ASM Lodge. “He is a reason skiing is part of the culture of the High Country,” ASM co-owner Brad Moretz said. Cottrell was presented with a regional recognition award by the Professional Ski Instructors of America/American Association of Snowboard Instructors Eastern Division, represented by Region 7 Director Walter Jaeger, saying it was only the sixth such honor in the association’s history. “Presented March 5, 2019, in recognition of an appreciation for longstanding dedication to and enthusiasm for snowsports education in PSIA-AASI Eastern Division Region 7 and outstanding contributions to Special Olympics,” the recognition states. Jaeger said that in his 50-plus years, Cottrell has brought a skiing culture to the region. Cottrell founded the French-Swiss Ski College in the winter of 1968-69. Based at ASM, French-Swiss teaches skiing and snowboarding to visitors from beginners to experts. French-Swiss taught its one-millionth lesson in 2005. “During the winter of 1968-69, Jim Cottrell, a ski instructor and head of the National Ski Patrol at Appalachian Ski Mountain, decided to offer a snow skiing course at Central Piedmont Community College,” the ASM website states. Reba Moretz — who along with her late husband Grady ran ASM since Grady and several partners bought the former Blowing Rock Ski Lodge in 1968 at a bankruptcy auction — spoke about the reach of Cottrell’s lessons. Moretz told stories about meeting people all over the world, including at the Salt Lake City 2002 Winter Olympics, who had taken lessons at ASM and French-Swiss. Moretz also complimented Cottrell on being a great business partner over 50-plus years. Along with the PSIA-AASI honor, Blowing Rock Mayor Charlie Sellers presented a proclamation approved by the town council on March 12 to Cottrell. Some of the listed accomplishments included developing college credit and recreation programs in more than 100 colleges and universities, being the official ski trainer for West Point instructors, Green Berets, U.S. Army Special Forces and U.S. Navy SEALs, developing the first ski program used by The President’s Council on physical fitness and many more. “Ladies and gentlemen, this could have been three pages; we had to narrow it down to one,” Sellers said of the proclamation. Jaeger spoke about how Cottrell was able to achieve his certifications so quickly, despite the strenuous exams. Another accomplishment of Cottrell's was bringing the Special Olympics Winter Games to ASM in 1977, an event that continues through this day. Cottrell has also developed and conducted training programs for athletes participating in three International Special Olympics games. A cake was created to replicate Cottrell’s ski show that was called “The French Swiss Ski Review,” which used a 60-foot movable ramp to conduct shows in shopping malls all across the South to spread the knowledge of skiing, according to the Blowing Rock proclamation. “People don’t realize the impact Jim and French-Swiss have,” Reba Moretz said. Jim’s son, Pace Cottrell, who works at French Swiss Ski College, said that when he learned of the accomplishment, it was Reba Moretz who wanted to throw the surprise event. Boone Area Chamber of Commerce President David Jackson said that three generations of his family learned to ski at ASM and thanked Cottrell for helping bringing people to the area, many of whom made the High Country home. A series of tables lined one of the walls with clippings, pictures and advertisements from the 50 years of Cottrell and French-Swiss Ski College. In the crowd were at least a couple dozen of the French-Swiss ski instructors past and present, including some of the original group of seven in 1968-69. Blowing Rock Town Council members question Blowing Rock’s interim Police Chief Aaron Miller, right, during a budget workshop on March 18. Pictured at the tables are, from left to right, Councilwoman Virginia Powell, Mayor Charlie Sellers, Mayor Pro Tem Albert Yount, Councilman Doug Matheson, Councilman Jim Steele and Councilwoman Sue Sweeting. Also pictured in the back are Jennifer Brown, Nicole Norman, Matt Blackburn and Kevin Rothrock. BLOWING ROCK — Re-evaluating the town’s contract with Watauga County regarding dispatch and 911 services is a priority of the Blowing Rock Town Council that will be discussed at the April town council meeting, according to a budget workshop on March 18. The frustrations came up with a discussion with Blowing Rock Police’s interim Chief Aaron Miller, who wants more control, Computer-Aided Dispatch terminals in vehicles and at the station, which he says the department currently doesn’t have. “We’re at their mercy,” Miller said of the county. Length of time on calls and miscommunication on hardware issues were two recent examples Miller said were part of his frustrations with Watauga County. The idea of withdrawing from the contract with Watauga County was discussed, with council members in favor of giving a year’s notice as contractually required before switching primary PSAPs as early as June 2020. The likely new primary PSAP would be the town of Boone. Miller said that CAD terminals in the vehicles was something he had in his Hickory Police vehicle in the 1990s, but said that if Watauga County doesn’t want to install them in the BRPD vehicles, they won’t. Further, Miller said that Boone Police could install mobile CAD software in the BRPD cruisers tomorrow, if possible. According to council members, both Watauga County and the town of Boone are primary public safety answering points, meaning that Blowing Rock, designated a secondary PSAP, could contract with either one for dispatch and 911 calls. Miller said that Blowing Rock averages about 10 calls through 911 each month, saying there are many more through the non-emergency lines. Mayor Charlie Sellers said he had met with Watauga County officials and said they know that Blowing Rock isn’t happy with the current service. “The way I see it, they have not lived up to their contractual obligations,” Mayor Pro Tem Albert Yount said of Watauga County. Councilman Jim Steele wants interim town manager Jim Freeman to look into the potential consequences of a switch and report back to council before they make a decision. Miller also brought up the need for a generator, which he said would cost $44,000, which would include operational expenditures. Tracy Brown, director of the Blowing Rock Tourism Development Authority, said that 2018 was a strong year for the group with occupancy tax revenue up 10 percent. “It’s the highest year we’ve ever recorded,’ Brown said. Brown provided an updated on short-term rentals in Blowing Rock, saying that 176 properties have been brought into the fold. A total of 24 properties were found to be operating short-term rentals that were out of compliance, Brown said. Councilwoman Sue Sweeting asked about potentially collecting occupancy tax from short-term rental properties in the past. Norman said that it needs to be addressed. Marketing in “ big” cities was a point of emphasis, with Brown saying Charlotte, Winston-Salem, Greensboro, Durham and Raleigh is where the bulk of business comes from. “Even if the economy goes down, we can bank on those markets,” Brown said. Going forward, Brown told the council he plans on focusing more of digital advertising and talked about how many people look at their phones for news. Going into 2019-20, Brown wants to focus on parking problems, saying that it’s more of a management problem with too many events on busy weekends. Another area of emphasis Brown brought up was keeping up with the times. Blowing Rock Fire and Rescue Chief Kent Graham said that his department received a $260,000-plus grant for all-new breathing equipment from FEMA, which covered most of what he would have requested. Graham said the air packs are currently on the trucks to be used if needed. Councilwoman Virginia Powell asked about the sign on the fire station along Valley Boulevard, saying that people drive by without knowing what it is. After discussion about past council actions, the council directed Freeman to ask Graham to put up the sign. Graham said that looking forward, he will likely ask for administrative help in 2020-21, saying that the workload is becoming too much for a part-time employee. A second boat and a trailer are part of a grant that Blowing Rock Fire and Rescue recently received, Graham said, and will be arriving in the next few months. Blowing Rock Planning and Inspections Director Kevin Rothrock discussed with council about a comprehensive plan update, recommending that an in-house report be done to see where they are in their 10-year plan that was completed in 2014. Blowing Rock Parks and Recreation and Landscaping Director Jennifer Brown showed council members its new “RecDesk” website where people can reserve the town’s amenities, such as the American Legion Hall, for events and pay with a credit card. This website includes resident and non-resident fees. Steele asked Brown if port-o-johns are needed for the parades, with the response being that the volume is there to justify them. Councilman Doug Matheson said that the Fourth of July parade is part of an all-day event and the Christmas parade is more of a single event. Brown wants to address updating the town’s playground equipment starting in 2019-20 and said it is a priority in 2019-20. Sweeting brought up that any new equipment will have to be wheelchair accessible. A potential Parks and Recreation Trust Fund grant could cover playground equipment and planned improvements to Park Avenue to waterproof the old firehouse building and put in a new sidewalk along the south side of the road. Other items discussed as priorities include upgrading the Memorial Park restrooms, potential restrooms in the vicinity of Annie Cannon Gardens and the Davant Field walkway. A wait-and-see approach will be taken on the potential needs on the Valley Boulevard median after the N.C. Department of Transportation finishes work this year and fulfills its 18-month landscaping contract. Purchasing of landscaping equipment should be done after a study on the use of the old firehouse space, Matheson said which is currently used to store parks, rec and landscaping equipment. Brown said that a master plan for the town’s space is planned to show how the town can best use it. Brown said the last such plan was done in 1988. Town Finance Officer Nicole Norman said that Freeman, who was not present, seeks to updated the town’s codes before he leaves in June. A big point of discussion was the recycling contract with Republic Services, who has proposed a 12 percent increase to continue providing services to the town. All of the town council members said they need to look at alternatives. “When do we say, this thing is not working for this town,” Steele said of the Republic Services contract. Yount said it sounded like to him that Republic wants to get out of recycling and they might just have to eat the increase this year while planning for the future. Re-qualification incentives for town employees and upgrading some of the town’s computers and upgrading software was also brought up by Norman. The empty property at 1150 Main St., as shown on March 18, where the former Blowing Rock Realty building stood prior to demolition on March 14-15. The former location of Blowing Rock Realty at 1150 Main St. in downtown Blowing Rock. BLOWING ROCK — The former Blowing Rock Realty building at 1150 Main St., that has stood since 1887, was demolished on March 14-15. The demolition comes after a condition rezoning permit was approved by the Blowing Rock Town Council in July 2018 for a new three-story mixed-use space that will have condominium and/or townhome units on the two upper floors and two retail or restaurant spaces on the first floor. The project will be constructed by Cardinal West Building of Durham. The next steps will be grading and pouring footings on the property. According to the Blowing Rock Planning and Inspections office, Cardinal West has not applied for a building permit on the property as of March 19. Hetherington made its presentation in July 2018 to the Blowing Rock Town Council. The project was approved with a variance of 17.8 units per acre in order to build the six residential units, up from the five units per acre that the town center zoning district allows. The planned 34-foot roof was another variance request that was granted, as was reducing the available green space from 75 to 40 percent. Sue Glenn spoke at the July meeting about the history of the building, saying that it was on the market since 2013 but no one bought is, as well as stating that the state historical structures office said the building was not eligible for restoration funding.